So here you are, about to sit the ISTQB Foundation Exam. Maybe you want to enter the world of Software Testing and want to get a related qualification on your CV/resume. Maybe you're already working as a Test Analyst and now your company has a new initiative where everyone needs to sit this exam. Either way, I hope some of the tips below can help. But first, I'd like to thank ISTQB for this picture. This is a visual summary of what to expect in the ISTQB Foundation Exam. There are 40 multiple choice questions. You have 1 hour to answer all of the questions. Bear in mind that a fair number of the questions are tricky so you definitely want to leave time at the end (10-20min) to go over answers and make sure that you didn't accidentally pick the wrong answer because you didn't read it correctly. Here's a link that summarises the exam structure. This is VERY useful. Make sure you look at this. K2 (30% weighting) Understand, explain, give reasons, compare, classify and summarise. Make sure you do not only the mock exam questions at the back of the textbook, but also past exams online. With regards to Testing Techniques, as you learn them- think about how you can apply them to the real world. 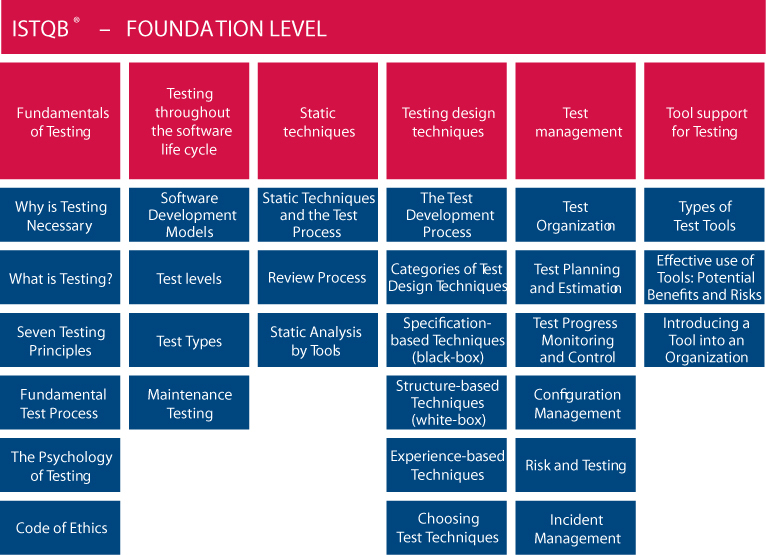 For Dynamic and Static Testing- not only should you learn the definitions but what it actually involves. i.e. Static Testing is Testing without execution e.g. going over documentation to make sure there are no defects. For tools, learn the different types, how an organisation would go about introducing it into an organisation and potential benefits and risks of testing tools. Someone taught me this tip in first year uni and I've made an effort to do this ever since. It works. That way, you can bounce ideas off each other and explain concepts that others may struggle/ be taught concepts you're having trouble grasping. Should you need to resit it, the price is the same. So there you have it, hopefully you came across some useful tips in this blog post for when you sit the ISTQB Foundation Exam. What tips did you find most useful? What other tips do you have for people about to sit the ISTQB Foundation Exam? If you've already sat the ISTQB Foundation exam, how did you find it?